The Pixie-Bob has a bobcat-like face, a spotted tabby coat and a short, bobbed tail. These cats come in both shorthair and longhair versions, and feature black tufts at the tips of their ears. The chin is prominent, and the eyes are hooded, giving the cat a wild look. Male Pixie-Bobs weigh anywhere from 12 to 22 pounds, while females are typically 8 to 12 pounds. The Pixie-Bob’s body is stocky and solid. Pixie-Bobs are also the only polydactyl breed recognized by TICA; these cats may have anywhere from six to seven toes on each foot. Pixie-Bobs are busy but not hyperactive. They tend to develop an unusually strong bond with their families, and love to travel in the car. They are easy to train to walk on a harness, and like to fetch. They are extremely quiet with only an occasional chirp. Pixie-Bobs usually get along well with other pets. 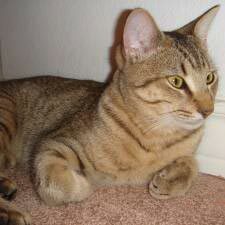 Pixie-Bobs are known for being good with children, and are exceptionally more patient with kids than most other cats. Some people describe Pixie-Bobs as being almost like a cross between a dog and a cat because they are devoted to their families but are catlike when it comes to being left alone during the day. People who live with these cats also describe them as being very intelligent. Pixie-Bobs enjoy being part of a family, and although they are okay left alone for hours at a time, they need lots of attention when you are with them. Long-haired Pixie-Bob’s need weekly brushing to remove loose hair and to discourage hairballs. The Pixie-Bob is sometimes confused with the American Bobtail, but these are two different breeds. In 1994, The International Cat Association (TICA) recognized the Pixie-Bob breed. The American Cat Fanciers Association also accepted the breed in 2005. Pixie-Bob breeders are currently seeking acceptance for the breed with the Cat Fanciers Association.